(1) care for the earth, (2) care for people and (3) fair share. (1) observe and interact, (2) catch and store energy, (3) obtain a yield, (4) apply self-regulation and accept feedback, (5) use and value renewable resources and services, (6) produce no waste, (7) design from patterns to details, (8) integrate rather than segregate, (9) use small and slow solutions, (10) use and value diversity, (11) use edges and value the marginal, (12) creatively use and respond to change. 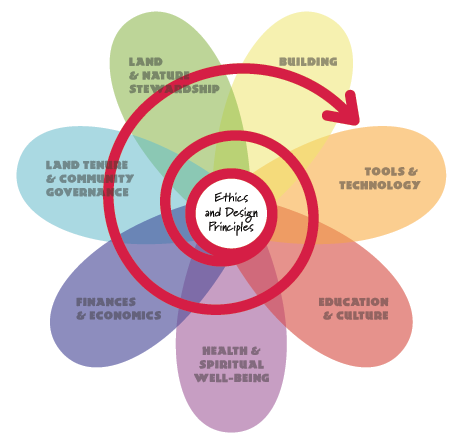 (1) education and culture, (2) health and spiritual well-being, (3) finances and economics, (4) land tenure and community governance, (5) land and nature stewardship, (6) building, (7) tools and technology.